You are here: Home / News / Congratulations Coach Wags! 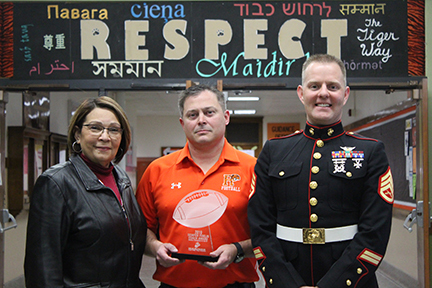 Riverside’s Head Football Coach, Patrick Wagner received the 2019 Coach Award from the Marines. Coach Wags was honored during a presentation for scholar athletes. The US Marines Corp Semper Fi Coaches Award is in its eighth year and is presented by the USMC and Glazier to honor coaches who are intentional in their efforts as leaders and who have a lasting impact on their athletes and communities. Way to go Coach Wags!